Recently I was trying to search best voice changer software for windows pc. Just because of it, we tried different voice changer applications and pc software but there are many difficulties to use them to change real time voice. For example, some windows pc voice changing software require to install virtual Microphone drivers. So if you are going to use these types of real time voice changer softwares those works after virtual microphone drivers installation, you have to change MIC settings every time if you want to use the voice changer app / software. It’s really very difficult to manage every time and seriously, very annoying. To mange this type of issue, we find a best voice changer software for pc and it’s completely free for everyone. No need to install any virtual drivers, it will setup all the things automatically and you can change your voice just in single click. No any deep information require to use it. Here we are talking about “Clownfish free voice changer pc software”. 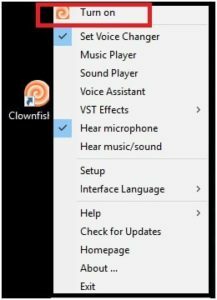 Just download appropriate “Clownfish free voice changer software” according to your own pc build and change voice in real time. You can also use this voice changer software during Gameplay like PUBG , CS Go ect. Download and installation of Clownfish free voice changer software is very easy. 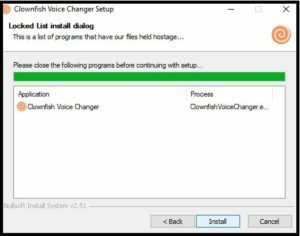 Just check below download section and download compatible Clownfish free voice changer pc software according to your own pc build. For example,If you have 32 Bit windows 7, Windows 8 or Windows 10 pc then download 32 Bit based Clownfish free voice changer software, otherwise download 64 bit supportable software. As we already told you, Clownfish software installation is very easy and no need to force any extra efforts. 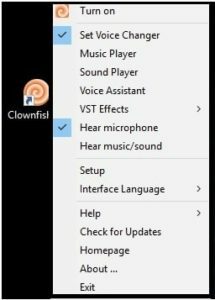 Just follow the below steps and install Clownfish real time voice changing software on windows pc. Visit on above download link and download the supportable voice changer software for your windows pc. Now run “VoiceChanger64f(0.93).exe” file as administrator. Follow the on screen instructions and continue the installation process. Installation process is same as other softwares. Just in few seconds installation process will end successfully and you will see a new “Clownfish” shortcut on pc desktop. Installation done!!! Now you are ready to use Clownfish voice changing software on windows pc. 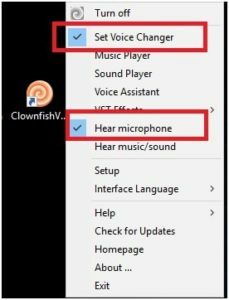 Now follow the below steps and configure the Clownfish software and choose your desired voice type which you want to apply during the gameplay. 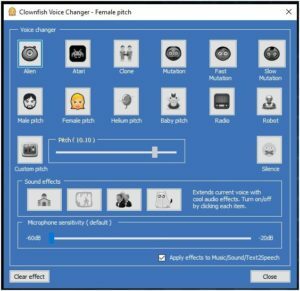 Clownfish software allows user to choose different voices like Alien, Atari, Clone, MutationFast, Mutation, Slow Mutation, Male pitch, Silence, Female pitch, Helium pitch, Baby pitch, Radio, Robot, Custom pitch etc. Double click on “Clownfish” shortcut from desktop and it will open different options as shown below. Click on “Turn ON” to start voice changing software on pc. It will start automatically. Now again click on “shortcut”, click on “Hear Microphone” option. After this you can hear your own voice in your headphone. Again open the software and this time click on “Set Voice Changer” option and it will open a new window to select different voices. Here you can check different voices which you can use to change real time voice instantly. Just double click on any one to select the desired option. Finally click on “close” button to apply the changes. After choosing your voice, disable the “Hear Microphone” option. So that you will not hear your own voice in your headphone. Whole process is very simple and no any extra skill require for to change voice using Clownfish software. Any newbie or advance user can change voice insanely without extra effort. Now go and troll your friends it works with any voice chat system like Discord, Fortnite, Skype etc.